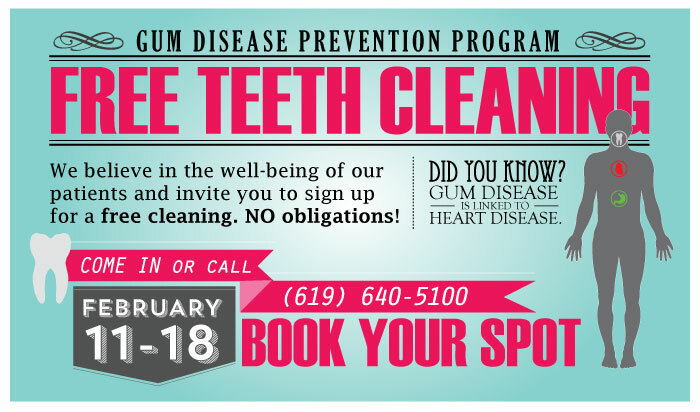 We will be providing Free dental cleanings to the public from February 11-18th as part of our gum disease prevention program. Call (619) 630 7174 to reserve your spot. Teeth cleaning specifically and dentistry in general, is no longer a painful and barbaric process. At least it isn’t as we practice it. If you live in San Diego, and haven’t had your teeth cleaned in a while, you may be surprised how simple and comfortable we make it. We use advanced, biocompatible dental hygiene tools and processes for teeth cleanings, and to restore your oral health. The cleaning process starts with our ultrasonic cleaner, which keep our teeth cleaning instruments immaculate. Unlike many San Diego practices, we take the time to do your cleanings by hand, to keep the dental cleaning experience painless, and our patients comfortable. We then spray our own combination of organic virgin coconut oil, xylitol and essential oils (cinnamon and mint), on your teeth to polish and clean them. We don’t use the traditional gritty paste you may remember from dental cleanings in the past. Coconut oil has particularly strong anti-bacterial properties, and additionally helps fight fungus, yeast and candida. Mint is used in many dental products for good reason, as it inhibits bacterial growth, and helps clean the tongue and teeth. Each ingredient has been selected to optimize the teeth cleaning process, while also enhancing your overall health. You’ll feel clean and fresh after the cleaning, as you have not been treated with chemicals. Did you know there’s a strong connection between gum disease and systemic diseases (like heart problems, strokes and diabetes)? We do not use gimmicks like a microscope to show any bacteria present (we all will have that to some extent), but again, take the time to measure the depth of the pockets between your gums and teeth manually, to help determine if you have periodontal disease. If you have pockets deeper than 4mm, we then provide you natural alternatives to make every effort to spare you the expense and discomfort of surgery. Coupled with a deep dental cleaning, and proper technique for brushing the gums, Dr. Vinograd’s patients have seen pocket reductions of 2-4mm, well back from the range that traditionally requires surgery. Your comfort is of utmost importance to us. If you have a problem with sensitivity of gums or teeth, that have made going to the dentist unpleasant, we have many solutions to make the visit easier for you. We take our time with your cleaning, and make sure you are fully comfortable before proceeding. You can even watch a movie or TV program while you’re with us to distract you during your dental cleaning. Take comfort in the fact that our staff are among the best anywhere and have solid training in the latest, most pain-free methods of helping you maintain a healthy mouth. You’re in good hands when you have your teeth cleaned and your oral health restored and maintained with us. Why Have Your Cleaning With Us? 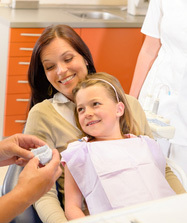 As a holistic dental practice, we care about your overall health as much as your oral health. We make our own fluoride, chemical, preservative free cleaning paste, and make sure our patients know the best ways to maintain their oral hygiene from home. We specialize in personal relationships, treating our patients like family, with great warmth and care. We welcome the opportunity to help patients that have any fear of the dentist from past experiences, and focus on painless methods to make you feel at home at our office.